Located on the Saigon River, Ho Chi Minh City (or called Saigon) is Vietnam’s major port and largest city. In this city, you can be comfortable to discover the stunning destinations including the ancient and the modern. Clearly, there are a lot of awesome historical places such as the system of museums and pagodas, Cu Chi Tunnel, and beautiful architectural buildings with Chinese and Western styles. As a result, Ho Chi Minh tourist is well-known as a good decision of foreigners by some main reasons. The Central Post Office is one of the oldest buildings in Saigon, which is the design of Gustave Eiffel who is a famous French architect then it has become a significant symbol of the city. Actually, this office has long been the busiest post office in Vietnam. 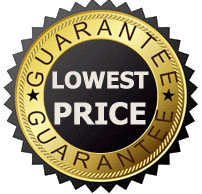 The Post Office provides many services like mailing, selling postcards or stamps with cheaper prices. 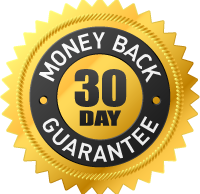 Moreover, you completely use foreign money exchange service in there. Notre Dame Cathedral (called Duc Ba church) – just one minute walk from the City Post Office, the church used to be the biggest one in Indochina under Colonial time. 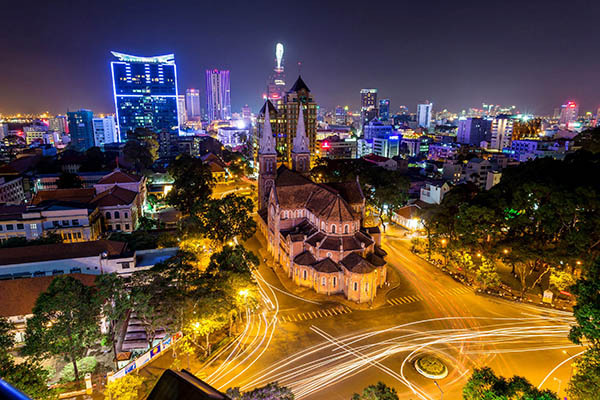 It is a wonderful building situated in the Paris Square in Saigon downtown, where is attracting almost tourists by its sacred atmosphere and neo-Romanesque style architecture. Duc Ba church is constructed on two bell towers nearly a height of over 58 meters. Following the French structure, Duc Ba Church established a community and religious services for French colonialists. Reunification Palace – marked as the fall of South Vietnamese Regime in 1975 and presently exhibiting various war vestiges. The war command room will be set up maps on its walls and telecommunications equipment on display, while basement rooms feature war propaganda materials. Next, the third floor is very interested in the featuring a card playing room and the above this floor makes a casino and a rooftop terrace with a heliport to entertain for guests. Ben Thanh Market – as one of Saigon landmark where a hundred of shoppers offer many goods including the foods and furniture. The market is a destination for many tourists, possesses the most ancient architecture, which is praised as one of the most attractive tourist sites in the megacity. Ben Thanh has a lot of goods specifically to serve the demands of tourists, such as souvenirs, unique clothing, silks, arts and crafts and brocades, but beyond products, what people buy on their trip to Ben Thanh market. You can buy the souvenirs for your family. In the night market, restaurants open their doors creating a vibrant street-side scene filling the air with the scents of wok-fried noodles, barbecued fish, and meats. In Ho Chi Minh tourist, Ben Thanh offers a great atmosphere that is absolutely authentically Vietnamese. Cu Chi Tunnel is being at the northwest edge of the City, this is talent network built under the ground of Communist side during the war against the American. Then, you can visit Cu Chi Ethnic Minorities Villages, which is about 8 kilometers from Cu Chi Tunnel. Additionally, you can learn about some ethnic minorities, who are now living in all parts of Vietnam, their costumes, their musical instruments and other interesting stuff. It ensures that you will get a joyful and unforgettable day as you are keen on Vietnam history and its diversified culture. What is the best for foods? 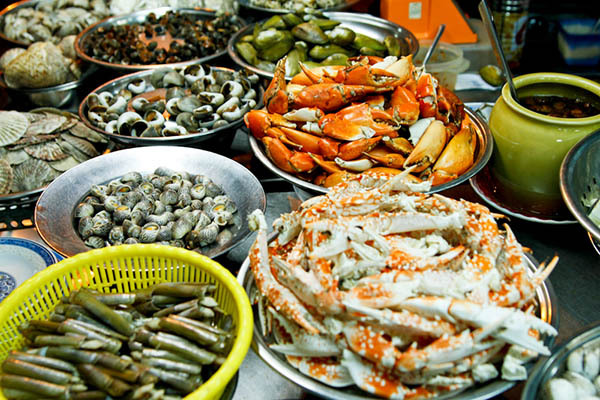 There is no better place to sample the delicious flavors of Vietnam. And Saigon’s French and other international culinary offerings are impressive too. Street food is very popular and it becomes the culture in the biggest city to make the impression of Ho Chi Minh tourist. There is a lot more to tempt your palate than just banh mi (filled baguettes) and pho. Vietnam is famous for pancakes made from bean sprouts, prawns and pork (vegetarian versions available) are legendary. Other dishes available include excellent Goi Cuon (fresh summer rolls with pork and prawn). The famous noodle is bun cha – a delicacy that consists mainly of rice vermicelli, slices of grilled pork and a unique dipping sauce that features some of Vietnam’s favorite ingredients such as fish sauce, rice vinegar and chili with vegetables, and some herbs and spices for extra doses of flavor. One of the most popular and cheapest drink in Saigon is Cafe which is sweeter and not quite as punchy as the equivalent brews in Hanoi. 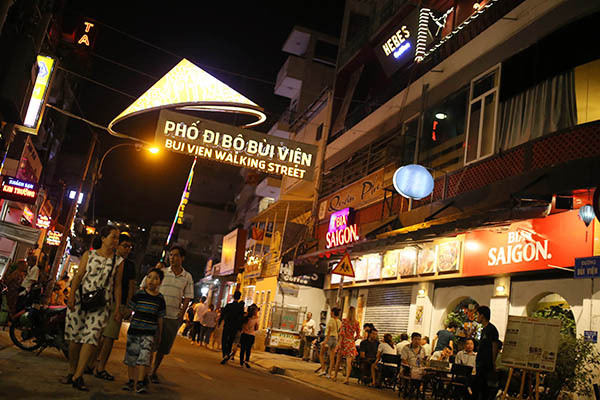 Firstly, Bui Vien is known as foreigner street which welcomes a large number of foreigners as well as local people to chat the night away and drink cheap beers on the small plastic stools along the street. Also, there are a lot of cheap restaurants and a few nightclubs here, so you have more choices. Secondly, take a taxi or “ Xe Om” to Nguyen Hue walking street by the way walking on foot to Night Market in front of Ben Thanh Pit stop for food. Practiced my haggling. Not a bad time. The night market is displayed shopping-wise, the fashion items such as inexpensive t-shirts, handicrafts, accessories, sunglasses and so on. 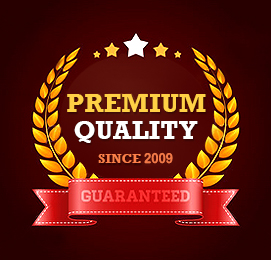 Therefore, customers feel free to buy souvenirs with a lower price than other shops. Thirdly, there are many popular bars, pubs in Saigon. For example, Lush Nightclub is a premier nightlife hotspot in Ho Chi Minh City. It is the real place to discover both of the young and beautiful of Saigon. For a romantic night in Ho Chi Minh, you will feel comfortable when taking a leisurely cruise down the Saigon River. The Bonsai Dinner Cruise combines a slow river journey aboard to grace overview of the city and enjoy Vietnamese favorites. You can join a live jazz performance on board and like a traditional Vietnamese dance. Fourth, some of the best Ho Chi Minh’s hotels include casino inside, so customers could hit the roulette table and try their luck on the slot machines. There are two biggest casinos in Saigon, which are situated in the Sheraton Saigon Hotel and Towers and Caravelle Hotel. Though casinos in Saigon are not on large as other big countries and some games are just available on a computer screen, you should spend a few hours enjoying it is always worthy.